A few months back I offered a contact I had made on twitter the opportunity to guest post on BCF. That contact had the twitter handle of Moon-Metropolis. I knew him from his asking me to link to his postings on Thought Catalogue. Postings he wrote under his real name; Joshua Goldberg. They were pretty good pieces, he is clearly a bright kid. He posted a few articles on BCF, notably the Pride Jarva piece. You can’t argue with success, that post went viral. Later via direct messages on Twitter, Moon, or Joshua Goldberg tried to interest me in doing a post about an online Jihadi named “Australi Witness”. He hoped to do a write up of this Australi Witness character he said. I showed little enthusiasm saying I thought the poster Australi Witness to be a blowhard and we left it at that, no article was ever submitted. Here’s a screenshot of our exchange. This is the link he references as a “detailed jihadist threat”. 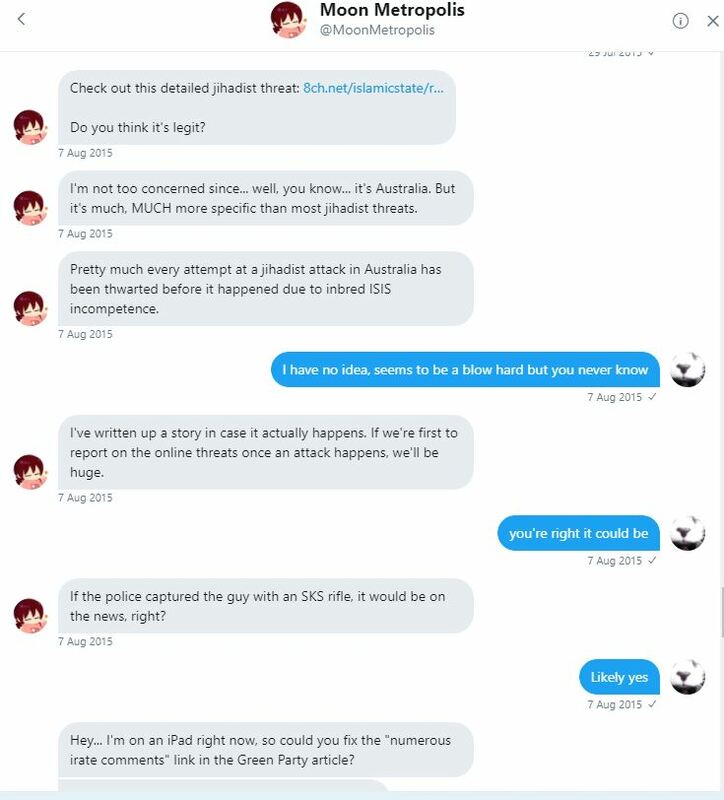 Little did I know that Joshua Goldberg, AKA Moon Metropolis was also the online Jihadi, Australi Witness. Joshua Goldberg has been arrested at his Florida home by the FBI, the result of a joint effort with the Australian intelligence services. He faces serious jail time if convicted, as much as 20 years. Joshua Goldberg had numerous online identities and a history of impersonation. Breitbart has more on Joshua Goldberg’s fantasist tendencies. An obviously bright kid who has dug himself a very deep hole.